If you need prayer we would love to pray for you. Please fill in the form below. At Hope Centre we are committed to the place and priority of prayer. We desire to host an environment of 24/7 prayer and worship for the nation and the nations. 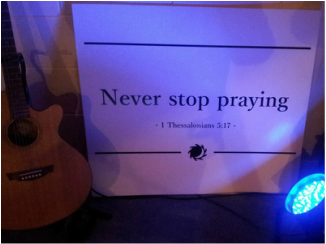 During our first year as a church we committed to praying daily from 7am-8am. In 2013 we increased our daily prayer to three hours a day from 9am-12pm. 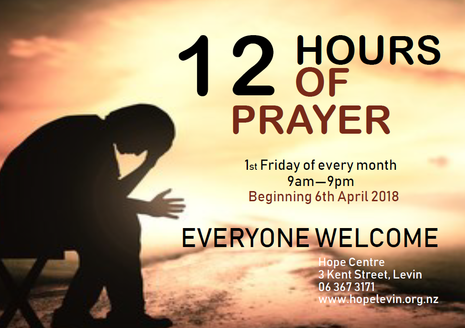 Starting on Monday 21st July 2014, we adjusted our three hour prayer meeting to two two hour prayer meetings, running from 9-11am and 11am-1pm Monday – Saturday. The first meeting will have a prophetic worship emphasis with the second more intercession.This is a priority time for staff and leaders and we encourage our people to attend and be part of these daily times. We are beginning to have brothers and sisters join us from other churches and we celebrate this. 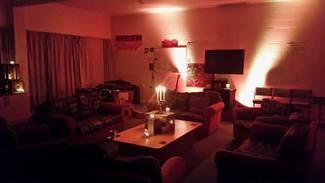 We have been praying that God would direct others to help build this environment of intercession and worship. We are needing more prayers and more worship leaders to either make time out of their busy life to take their place in these meetings or some very called individuals who want to give a season of their life to this needed purpose. 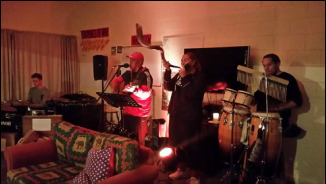 We are especially keen to have people join us at Hope Levin to dedicate 3,6,9 or 12 months to daily prayer and or worship. These positions are voluntary and require people to be self funded. As God gives us more people, we will increase our prayer commitment. ​Contact the office here at Hope with your details and questions and we will connect with you.